James Henry Coffin was born in Massachusetts, the third of seven children and a descendant of Tristam Coffin, who emigrated from England in 1642. Bank failures which caused the loss of the family fortune and his father’s death several years later, forced Coffin to consider working in a trade, but his cousin persuaded him to enter Amherst College in 1823, something Coffin later said was the turning point in his life. Following graduation, Coffin worked in the field of education and in 1838 began meteorological studies which became his life’s work, specifically, the development of his theory of the winds. While at Williams College in 1840, he built an observatory and installed the first combined, self-registering anemometer and barometer for recording wind variations and barometric changes. 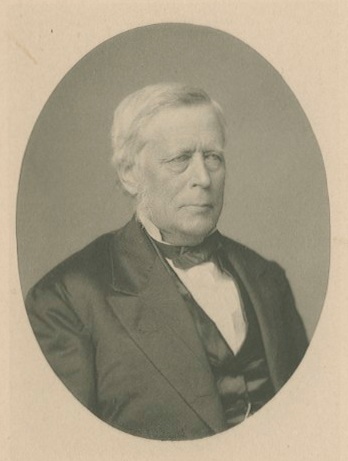 Coffin came to Lafayette College in 1846 where he helped the college move ahead in its science curriculum. He was a professor of mathematics, natural philosophy and astronomy. In 1864 he was instrumental in establishing the Green Observatory, a building that no longer stands. In addition, he served as Vice President and Treasurer of the college. During this time period Coffin began his collaboration with the newly established Smithsonian Institution and collected information for them on the motion of winds for more than thirty years.